GPM has completed structural repairs on the iconic Tathra Wharf, replacing piles and headstocks as well as approximately 400m2 of decking. GPM was recently engaged by Northern Beaches Council for dredging works and beach replenishment at North Narrabeen. 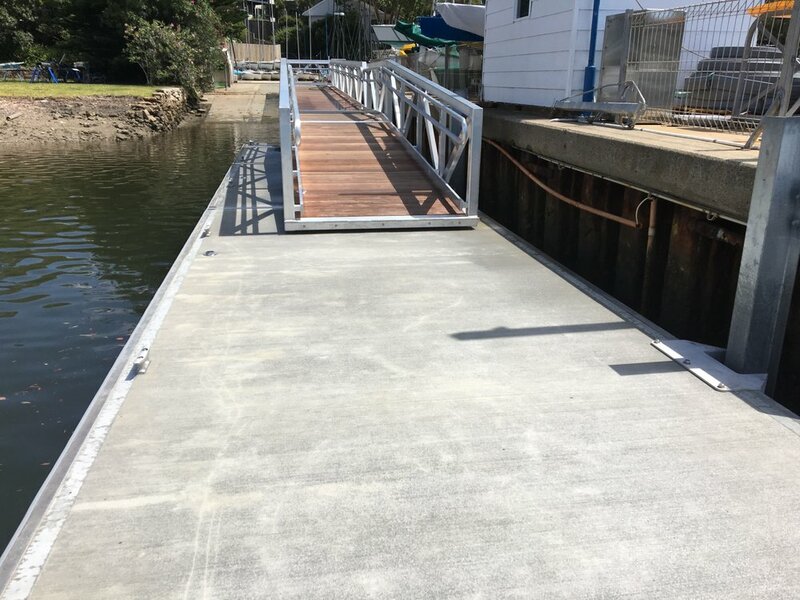 GPM has completed demolition of the old concrete jetty, and has replaced it with a new floating pontoon jetty which includes a stub jetty and floating walkway. Installation of piles for new floating marina. Complete refurbishment of existing jetty for Roads & Maritime Services. Clearance dredging at new Bastion Pt Ocean Access channel after heavy storms forced a large migration of sand inhibiting vessel access. Approx. 4500 cubic meters of material dredged. A continuation of past projects Lyne Park Stage 1 and 2. GPM were contracted by Woollahra Municipal Council to renew another 60 lm of the failing seawall. 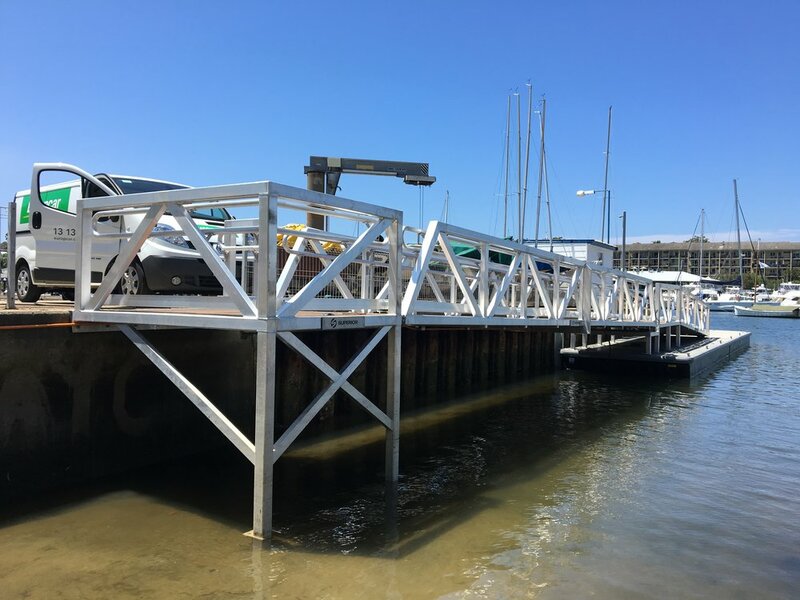 GPM has successfully completed the design and construct of Stage 2 of Metung Marina, including 550lm of fully serviced floating concrete pontoons and gangways. GPM Constructions underwent major improvement works to Kianinny Jetty in 2016, in order to service the improved boat ramp on site. The jetty upgrade included new concrete suspended decks and berthing faces, and the removal of rock outcrops below the waterline along the berthing faces, which posed a fouling hazard to boats at low tide. The new structure was supported by piles socketed into rock. This project also included the installation of ladders, mooring cleats, bollards and berthing fender. 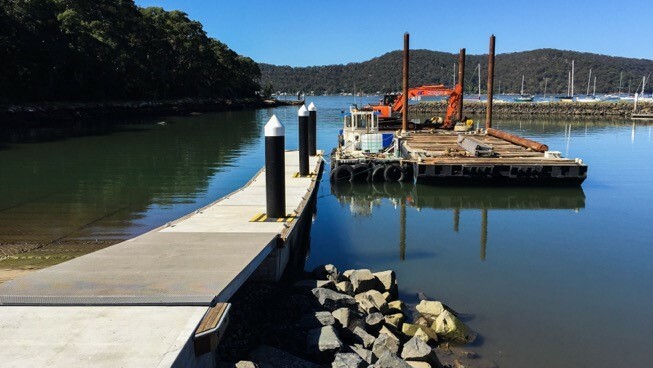 GPM has completed upgrades to Boat Harbour, Port Albert and Victoria, with new timber piles including stainless steel mooring bars and fibreglass caps. GPM has completed the replacement of navigation aid piles, including UV stabilised UHMW day-shapes & solar powered / GPS enabled marine lanterns in Corner Inlet, which is a major shipping gateway servicing gas & oil rigs in Bass Strait. 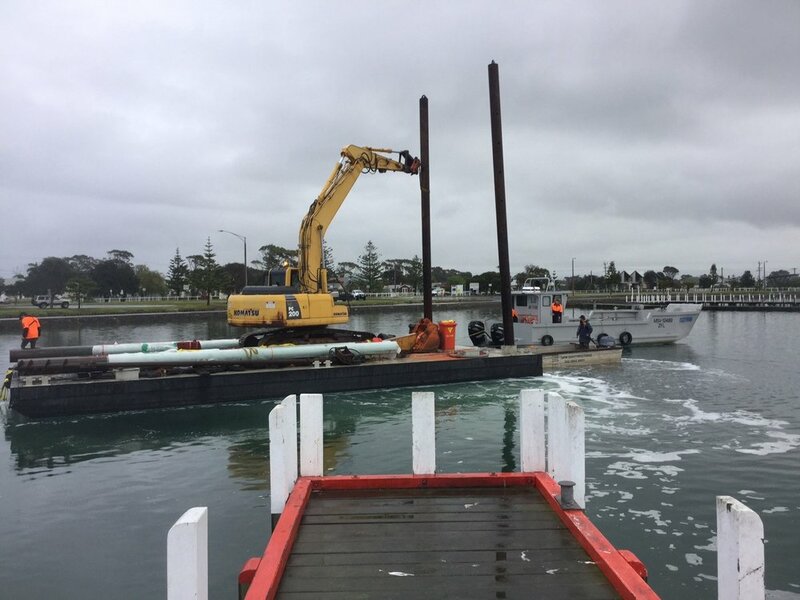 GPM was recently engaged by Bega Valley Shire for post storm structural repair to Quarantine Bay Jetty Pontoon, and the installation of two new steel piles. Swansea Channel was dredged to widen and increase navigational depth for access by larger vessels. Sand was pumped 350m to a nearby island for beach nourishment. 4500 cubic meters of material dredged. GPM recently undertook the demolition of the iconic Sydney Seaplanes Headquarters at Rose Bay Sydney, as well as the design and construction of a new piled and precast concrete foundations. Difficult site conditions were overcome with strict planning and management, which was critical to completing the job to specification. Works were executed through April To June 2016. GPM dredged rock at the entrance of Currambene Creek for Shoalhaven City Council, enabling safer and easier passage through the busy channel which is popular with local tour operators and leisure craft. 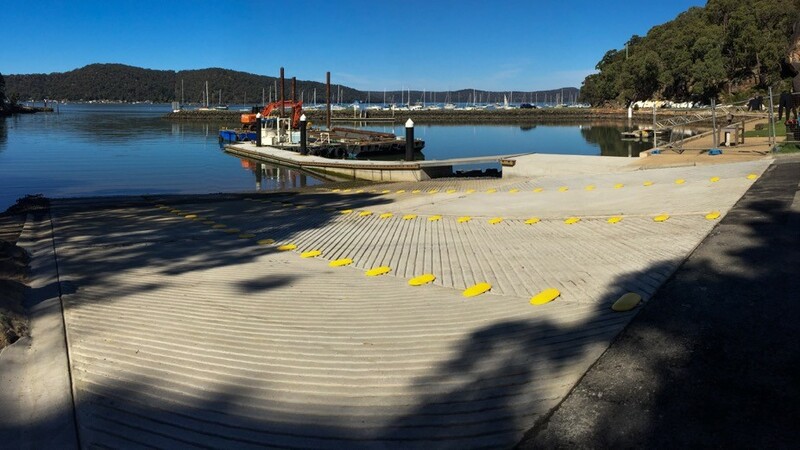 GPM has constructed a new boat ramp at Parsley Bay, giving our region’s water lovers far better access to the Hawkesbury River. A new pontoon has also been added, which will significantly speed up the boat turnaround and reduce the waiting time. 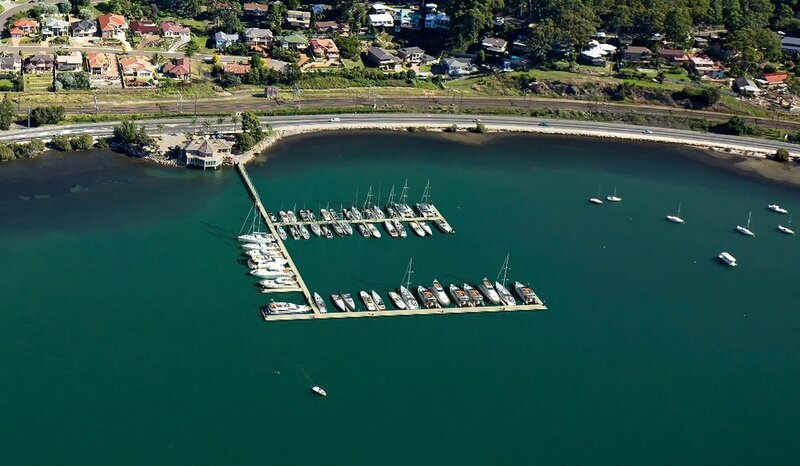 This is good news for one of Sydney's most popular boat ramps. Design and construction of new fuelling pontoons at Clifftonville Ski Lodge. Rebuild of Seawall between Catalina's and Sydney Seaplanes. GPM recently undertook the construction of a new 2 lane, piled, beamed and pre-cast boat ramp, with rock walling and stone groyne. GPM was working closely with JK Geotechnics for extensive exploratory drilling, for the proposed Bays Promenade Boating Facilities. 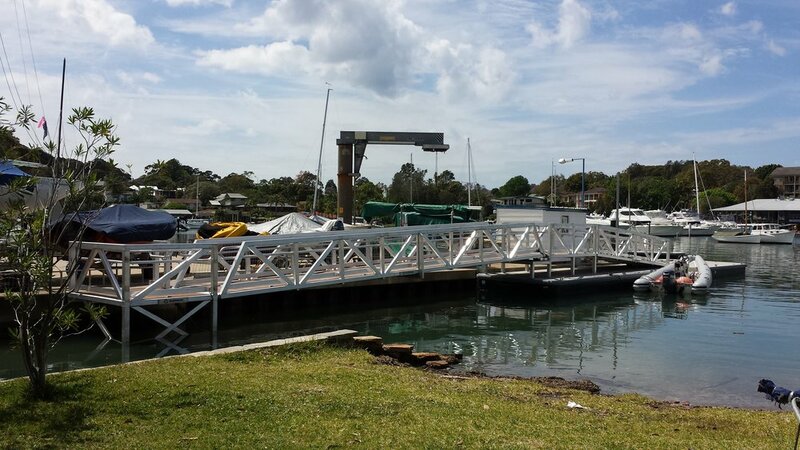 GPM Constructions demolished and reconstructed a 12m by 1.8m long timber jetty with an attached floating pontoon. After heavy falls GPM were appointed by Woollahra Council to complete this emergency clearance and remediation work, which included new stone block walls and rock armouring to base of culvert. Complete refurbishment of Port Macquarie marine rescue jetty. Installation of piles, horizontal walers and reinstatement of road. Contracted to carry out the piling portion of the project, GPM installed 6 steel piles used to support the proposed, fixed, pre-cast concrete jetty, and 2 larger and longer pontoon piles. All piles were cut to height, and HDPE sleeves were installed in preparation for other works carried out by another contractor. Divers were used to clean up the harbour floor at Eden as part of the preparation works for the future development in that area. From old anchors, tyres, to old steel sheets used to repair ships, GPM salvaged over 100 tonnes of material off the floor and disposed of it all off site. The Eden crew transfer wharf at Snug Cove was upgraded to accommodate the anticipated increase in usage. New timber decking and galvanised handrail was supplied and installed to improve overall usability. A large storm caused significant damage to the break wall at Bastion point Mallacoota, and urgent repairs were required. The repairs were carried out by our 45t Komatsu excavator from the crest of the wall using salvaged rocks that were moved from the wall by waves, and additional rock was imported to increase the structural integrity of certain portions of the wall. Demolished and rebuilt the first 225m of the Rosebud Pier for Parks Victoria as part of the stage two major maintenance works to the Pier. The existing timber jetty and the concrete boat ramp was demolished to make way for a brand new floating pontoon and concrete boat ramp. The carpark was also refurbished by widening in some areas, and new asphalt and line making installed. The design and construction of Metung Marina for East Gippsland Shire Council involved the demolition of the existing 450m of a dilapidated timber marina, and replacing it with a newly built steel and timber structure 500m in length. There is a combination of steel and timber piles totalling 250 piles, all of which are 24m long. The structure itself will be timber with a fibreglass mini-mesh decking. Repairs to the aluminium gangway and structural work to the floating pontoon. Complete refurbishment of floating pontoon and aluminium gangway. Contracted by Manly Council, GPM removed the faulty gate valve at Fairy Bower pool. The pool was emptied and closed to the public to allow divers to access the existing valve, remove it, and replace it with a new one. GPM Constructions were contracted by Woollahra Council to fully refurbish the 50m long heritage pedestrian bridge at Parsley Bay. This project involved extensive remediation work and replacing of the existing bridge components. Being an extremely delicate project due to the old protective coatings being harmful to the environment, GPM had to ensure the appropriate care was taken during demolition and disposal. The project was carried out progressively along the bridge a section at a time, with great effort to ensure that all works were encapsulated and environmental controls were implemented at all times. Roads and Maritime Services contacted GPM to install 3 mooring piles for the Bluff Point Ferry. The piles are designed to secure the ferries during time of flood, and as such were required to be 23m long. Using a 130t crane, we pitched the piles and drove the piles into the riverbed using a 9t Junttan hammer.